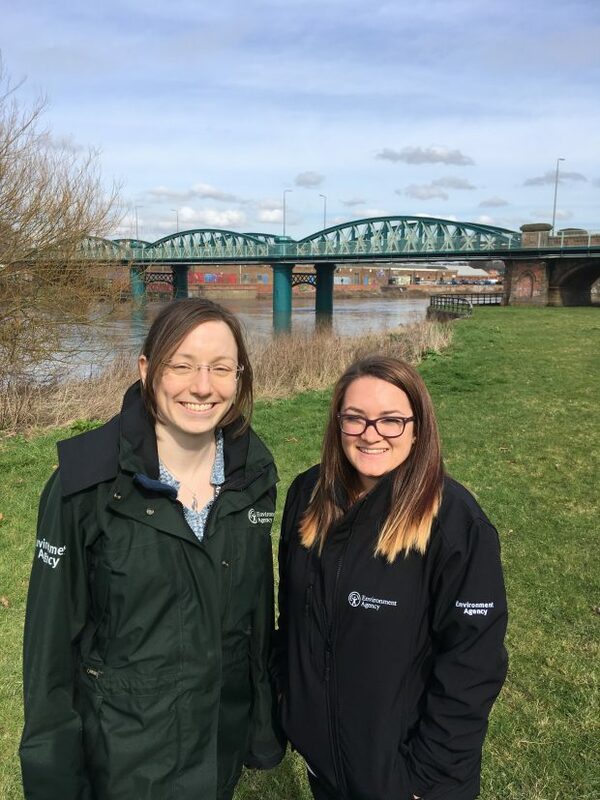 In this blog, Becky and Gabi write about their experiences as female engineers, the Environment Agency graduate scheme from both mentor and trainee perspectives and the Next Generation event at the Flood and Coast conference. Becky Sharpe: I’m Catchment Engineer for Derbyshire, Leicestershire and Nottinghamshire in the East Midlands. This means working with our excellent teams who make sure our flood risk assets all work as they should. My role is incredibly varied and no two days are the same. I like the balance between technical engineering overview and working with people. Gabi Difrancesco: I started at the Environment Agency 18 months ago, straight after I graduated from the University of Nottingham with a Masters Degree in Civil Engineering. I specialised in hydraulics (water) and environmental engineering so the EA was the perfect match for me. Becky: As well as my main role as Catchment Engineer for Nottingham, Leicester and Derby, I also support three graduate civil engineers, including Gabi. I came through the EA’s graduate scheme myself and gained Chartership with the Institution of Civil Engineers in 2015. I now enjoy the opportunity to share my experience and help others develop. I find this a really rewarding part of my role. Gabi: I started at the EA on the graduate scheme in September 2016 with Becky as my supervising engineer. For me, it was very comforting having someone there to answer questions who had been through the same experience and had achieved the goal I am working towards. Becky knew what it was like to be a young (female) engineer joining an organisation where some of the people I work with have been looking after rivers since before I was born! Becky: I always had great support from my supervising engineer and other graduates as I progressed through the scheme, so I encourage Gabi and the others to support each other. It was a natural progression from being trainee to mentor, as I started by supporting newer graduates whilst I was still learning myself. I’ve always found the best way to learn has been to get thrown in at the deep end with support from someone more experienced. Gabi: When I’d been here six months, Becky encouraged me to take the lead on a construction project under her supervision. I had the challenge of coming up with the best way of delivering a quick solution to a floodbank that was eroding into the river. To do this, I worked closely with our field teams to come up with a safe way of working, spoke to landowners and wrote to local residents. Engineering is all about problem solving, so combining the theory I learned from my degree with the experienced learned from those around me at the EA, we came up with the best solution. Becky: Personally, I really enjoy seeing how the graduates flourish as they are given a range of challenges to push them outside their comfort zones. It also challenged me to find the balance between letting Gabi lead whilst making sure she had the support and knowledge to complete the project safely. I like the fact that Gabi is willing to try new things, but will always let me know if any of the work is a step too far, so I can point her in the right direction. Gabi is full of energy and enthusiasm as well as being quick to ask questions, which keeps me on my toes! Gabi: Following Becky’s lead, I have helped to mentor newer members of my team and have recently started business mentoring a student from a local school. It’s about showing students how many options they have. Personally I feel engineering was never really advertised as a career at school, and even when it was, the focus was around bridges and cars. There’s so much more to engineering that kids don’t get to see. I think it’s really important to change the image of engineering which events like Flood and coast Conference really promote and show the breadth of careers out there. I really enjoy volunteering at events to show that girls can be engineers too. Becky: One of things I love about the Environment Agency is that I feel I can be a ‘good engineer’ not a ‘good female engineer’. It’s great to see more women coming into engineering as demonstrated through our most recent intake of graduates being more balanced than ever when I came into engineering. The scheme encourages support across the whole country between the graduates, and I keep in touch with other supervising engineers to ensure we provide the best possible experience. Developing our next generation of engineers is really important, both with graduates like Gabi but also our technicians such as those coming through from our field teams. This means we have talented and enthusiastic people who really understand how the Environment Agency works and what needs to be done to reduce flood risk. Gabi: We are both attending the Flood and Coast conference, at which I am going to the Next Generation workshop event on Tuesday 20th March. This is aimed at people new to their careers in engineering and flood risk management. The event gives us a chance to meet with other graduates and leaders in the field, supported by lectures and workshops. We hope to share our experiences of the event with others whilst we are there.